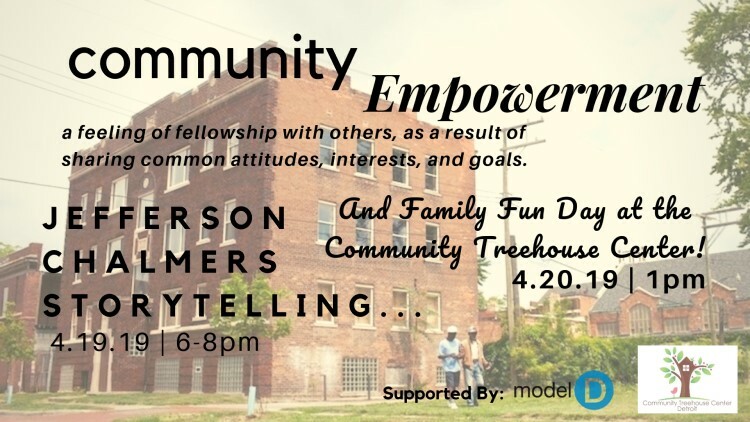 Model D Media, in partnership with the Manistique Community Treehouse Center, is proud to host a two-day community empowerment event to celebrate the past, present and future of the Jefferson Chalmers community. The storytelling event will take place on Friday, April 19; and, a Family Fun Day event will be held on Saturday, April 20. The storytelling event will take place at Hope Community Church, 14456 E Jefferson Ave, Detroit, MI 48215 from 6-8pm. New and longtime Jefferson Chalmers residents, business owners and community leaders will share their stories of life in the historic Detroit neighborhood, including fond memories of growing up and/or raising a family in JC; and, the growing diversity and development to foster the community’s legacy for generations to come. Light fare will be provided by Norma G’s. Residents from surrounding communities are welcome to attend! To RSVP for the storytelling event, please click here.